Paul Soul Entertainment provides Party DJs; Wedding Entertainment (we can cater for your Ceremony; Pre-Reception and evening Reception Entertainment) and Entertainment Services for our Entertainment Partners around Dublin and it's surrounding areas for over 25 years. At Paul Soul Entertainment we aim to meet YOUR needs and will arrange consultations prior to your event to ensure maximum satisfaction. At Paul Soul Entertainment we work with our clients to create the perfect event every time. Music and entertainment are the foundations of Paul Soul Entertainment. We guarantee to provide you with a first class entertainment experience through our select team of experienced and professional Party DJs; Solo Artists; Bands and Wedding Entertainment services. Our Entertainment Packages and personally customized booking services will guide you through planning an unforgettable event to make it everything you dreamed of and the best event possible. We provide specialised wedding DJs who have years of experience in the wedding industry. Complete party entertainment including party DJs with state of the art lighting and sound equipment. Paul Soul Entertainment collaborate with companies and organisations to create the perfect corporate event. We provide some of the best bands in the Irish music scene who have years of experience in the music industry. 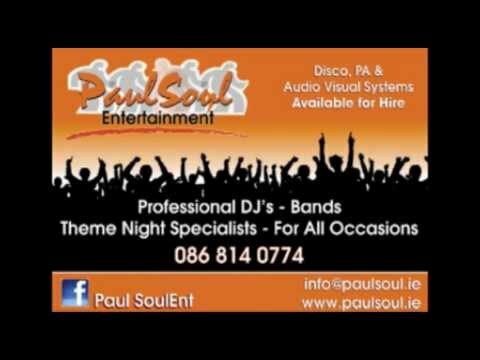 Paul Soul Entertainment is one of the leading entertainment companies in Ireland. Paul Soul Entertainment can provide ALL of your entertainment needs from music to lighting and state of the art sound, we have all bases covered. At Paul Soul Entertainment we have music to suit everyone's needs, from full Wedding entertainment to solo acts and 5 piece bands, DJ's to traditional Irish music and karaoke. Paul Soul Entertainment promise to provide our clients with a memorable night. John was brilliant! He was just perfect, he really knew his stuff. He ensured the night was enjoyed by all, without being intrusive. A few of my friends commented on this also, there is nothing worse than someone who's constantly on the mike talking more than anything else. He did some birthday kisses for me which was nice. He was also great at sticking to the seventies theme throughout, having consulted with me early in the night to see what I wanted. I just felt that the whole thing went brilliantly, I couldn't have been happier. This was a huge occasion for me and I am delighted with your service. I had been at an event with one of your DJs (Trinity Nursing School Christmas party in Guinness) which is how I found out about you. I thought the DJ that night was excellent and so was keen to use you for my special night. After Saturday night, I'd happily recommend you guys for any other event.